This morning I studied Hebrew with my friend again on Google+. We are probably two of the slowest Hebrew students ever, but we love it so much and want to learn it so much that I think God should just give us an “A” for effort. Studying Hebrew with my friend is one of the highlights of my life because we laugh and have so much fun. 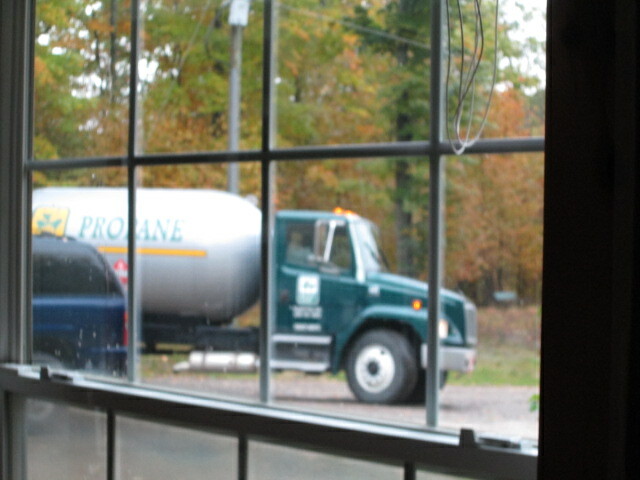 While we were studying, the Propane Guy came to fill up our propane tank. Poor EJ hadn’t been to bed very long, but I woke him up to deal with the Propane Guy because I have never, ever before lived in a house using propane and I felt out of my depth. There probably was nothing to it except to point to the tank and then write a check, but dealing with the Gravel Guy seemed simple too until he asked me questions that I had no idea how to answer. When the Propane Guy came to our door so we could pay him, I saw him pick up Tesla and cuddle her, which automatically made me like him. I have a lot of Irish in my ancestry, so the name of our propane company is appealing: Blarney Castle. A week or so ago EJ told me that he had been practicing what he would say when he called to order the propane. In an Irish brogue he said, “Sure, an’ I’ll be needin’ some pro-pane brought to me wee humble cottage, the one at the top o’ the hill on the road to our little valley.” He didn’t actually say that, but we had a bit of a laugh at the thought. Today was another first: It was the first time I have ever been in Northern Michigan when it snowed. This morning it started out raining, and then it switched to snow, and then it went right back to rain in the blink of an eye–but it was actually snow. I thought that was the most we’d get, but then towards evening EJ pointed to the window and I looked outside and it was snowing, snowing, snowing. Excited, I ran outside with my camera and took a video of it. This is the first time I have seen it snow so early in the year in a long, long time–and maybe ever. When I was a child growing up in mid-Michigan, I remember getting snow in November and even a little in late October. However, for years and years we have had late snow–sometimes not even until January. Snow this early in the year is amazing. Winter weather is rapidly arriving and I’m not sure I’m ready for winter. I’m not quite sure what to expect from a Northern Michigan winter. However, it’s coming whether I am ready or not. I think it will be an adventure. It does feel like being a squirrel hurrying to gather nuts, doesn’t it?